Watch the Grand Final live on Sky Sports Main Event and Sky Sports Arena on Saturday from 5pm. Our Grand Final countdown continues with some of our greatest moments at Old Trafford. Here, our four pundits pick their greatest game played at the showpiece event. On Tuesday, we shared Barrie McDermott, Phil Clarke, Brian Carney and Terry O'Connor's selections for the greatest Grand Final and put it to a vote for you. On Wednesday, they picked their favourite individual performances from over the years, and now they are picking their greatest game played at the Grand Final. See their picks below and vote for your favourite! A game which Terry featured in. The first Super League Grand Final, the first Old Trafford showdown, saw the best two teams in the regular season - Wigan and Leeds - face off. Terry, starting in the front row, said: "We did not know what to expect and were all a little taken aback. We had gone out for a warm-up and the stadium was not exactly full at the time. But then the walk out was amazing with all the fireworks and the crowd going mad. "That set the stage for a brilliant sporting event." It was Terry and his team-mates celebrating at the end of the night. Despite Richie Blackmore opening the scoring for the Rhinos, Wigan hit back thanks to that Jason Robinson stunner. 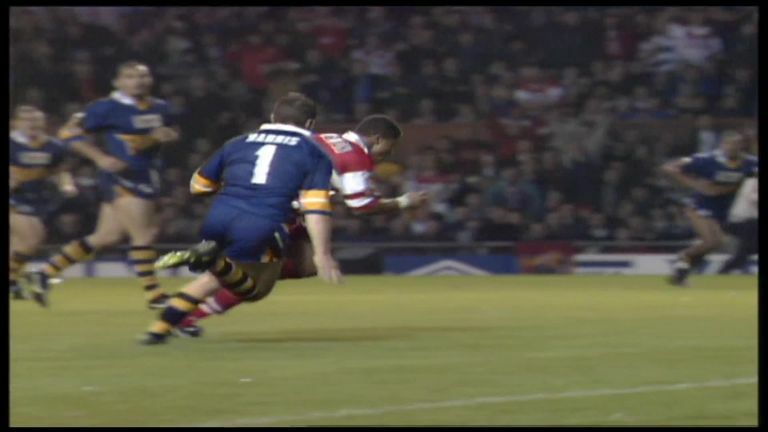 It was a lead they never relinquished, Andy Farrell adding two penalties to seal the first Grand Final. Perhaps an obvious choice for Barrie given he appeared in the 2004 Grand Final, as the Leeds Rhinos ended 32 years of hurt. The Rhinos dominated the regular season, topping the table, but they were stunned by the Bulls in the play-offs. The two rivals met again at Old Trafford in a tight encounter. Leeds led 10-4 at half-time, Matt Diskin crossing for their try after Bradford led early through Lesley Vainikolo. Shontayne Hape's score reduced the deficit and the Rhinos led just 10-8 going into the final five minutes. Then they made history. From a scrum, Danny McGuire fed Keith Senior, who returned the ball to Super League's top try scorer to dive over. Cue pandemonium among the Leeds players and fans, ending the long wait for a league title and a first title of eight. Brian calls it sporting drama of the highest order. And it will take some game to beat the 2002 Grand Final between St Helens and Bradford. The teams had shared three tries each in a pulsating encounter, Scott Naylor, Robbie Paul and Michael Withers all going over for the Bulls, while Mike Bennett, Sean Long and Martin Gleeson crossed for the Saints. All square with ten minutes to go with Long, Paul Deacon and Paul Sculthorpe all missing the chance to smash over a one-pointer. With 60 seconds to go, Long got another chance. This time, the half-back, left footed, nailed it through the posts. Up went referee Russell Smith's arm, St Helens fans dancing in the stands to Dario G's Carnival De Paris blaring through the speakers. But the drama wasn't over. From the kick-off St Helens took the ball up through Chris Joynt, who appeared to go down in a voluntary tackle. Bradford wanted a penalty. Smith said no. The final hooter went and the Bulls raged, with James Lowes particularly blowing a gasket. A moment that will never be forgotten in Super League history. A match to be remembered, but not for all the right reasons. Just two minutes in and Ben Flower made history. And not in a good way. He laid out Lance Hohaia after the half back hit him late, knocking him to the ground initially before following in with another punch while the New Zealander was prone on the pitch. The prop left referee Phil Bentham with no choice but to show the first red card in Grand Final history. Hohaia didn't return to the pitch and never played rugby league again. 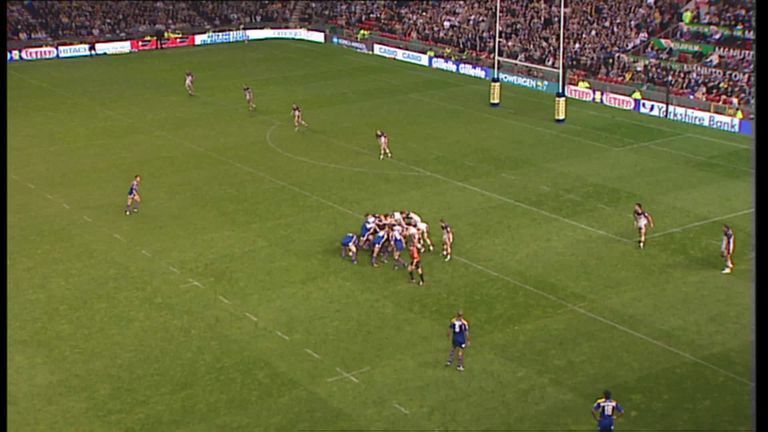 Flower's Wigan hung on valiantly with 12 men. They actually led at half-time thanks to a try from Joe Burgess. But Shaun Wane's side ran out of steam. 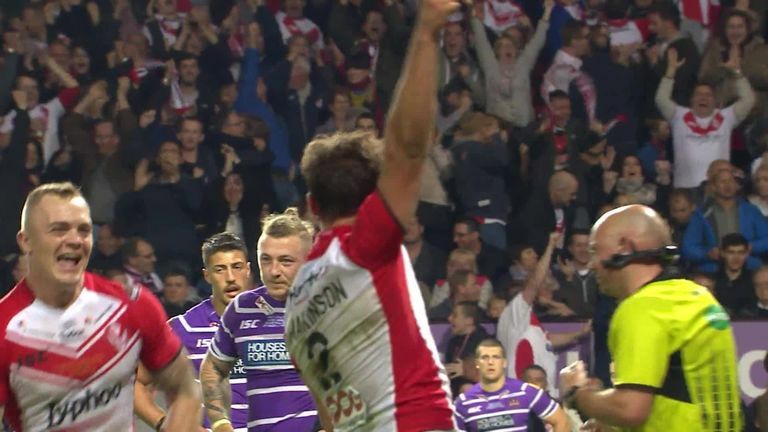 St Helens crossed for two second-half tries through Sia Soliola and Tommy Makinson to seal a 14-6 victory and a first title since 2006.